It's time again for Furniture Feature Friday over at Mustard Seed Creations. Come on over and see all the beautiful furniture being shared. I'm joining the crew over at Coloradolady for Vintage Thingies Thursday! Pick a favorite vintage "thingie" from your stash and come share in the vintage goodness! Southwestern Kansas in the early part of the 20th century. 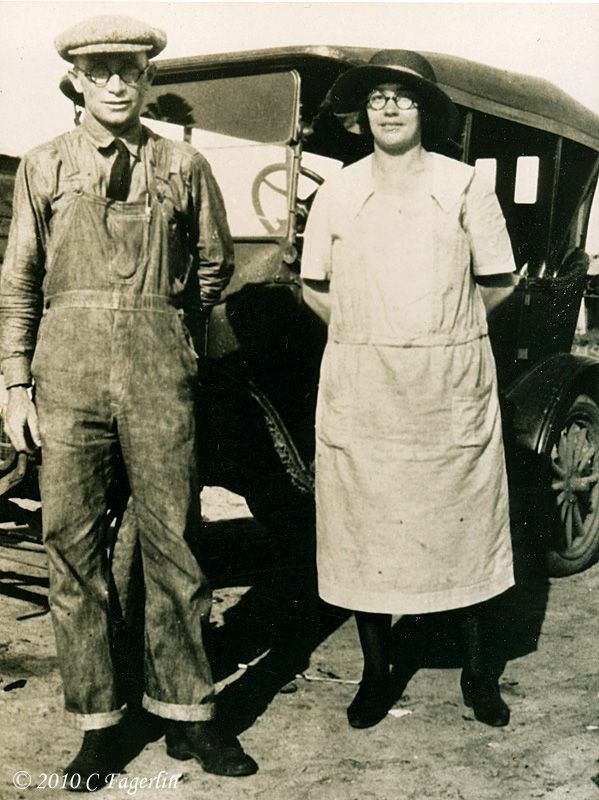 My maternal grandparents when they still had the farm. then later to a smaller town of 250 people. on the top floor after baking in the Kansas heat all day???? to live with my mother. About 10 years ago it came to live at my house. have the staying power that this little guy has shown. make it just another spool leg table. you all again next week with more Vintage Thingies. Oh, that picture of your grandma's house is the snow is most magical indeed! I love that picture! 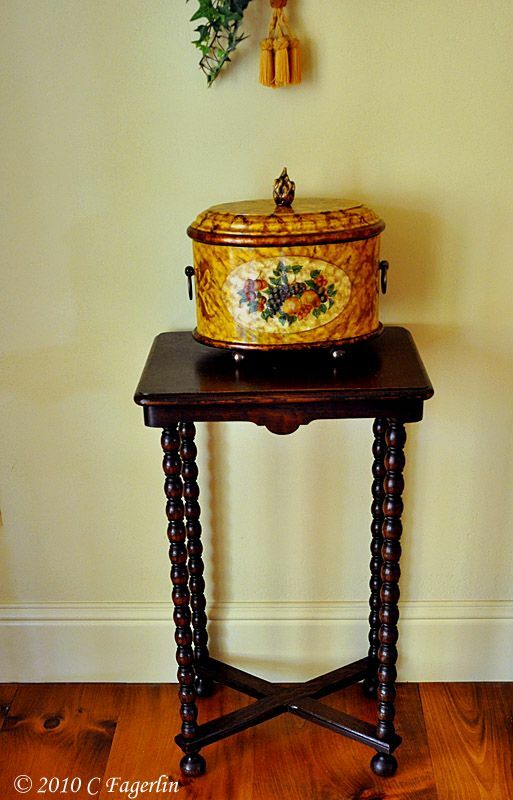 Your side table is amazing too, and I tend to agree, the younger generation today does not cherish such pieces as the later generation! Your table is Lovely!!! Happy VTT! What a post full of treasures and memories you shared today. I am glad you were fortunate to get them and appreciate them as well. Wonderful memories. 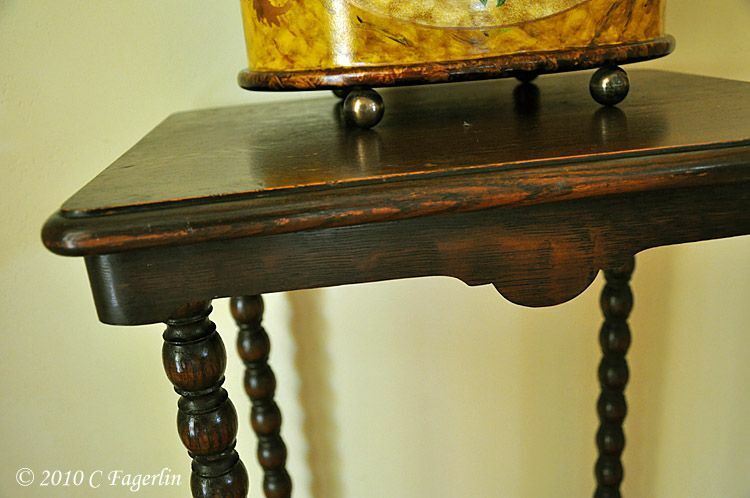 That little table is perfect just the way it is, and original finishes are always better. I think it would be a mistake to paint it. Was that house a prefab home? The reason I ask we had some that looked just like that in my small town. They could be ordered from Sears and Roebuck. Great post. Great memories of your grandparents--mine were from the Wichita area. I love that table! Very decorative. Oh, don't paint it! I am a lover of chippy paint, don't get me wrong, but I think it's fabulous as it is and especially since you hold such fond memories of your grandmother- leaving it this way is a lovely tribute to her and it looks amazing against your floors! I loved this post, reading about your grandparents, and the pretty table. I would leave it just as it is. What is in that pretty box on top? That snowy picture of your grandparents house is beyond gorgeous. Somehow,you need to make cards that have this on them..ooo,just beautiful. I loved the picture of your grandparents..they were lovely and the table, please..leave as is. The worn places have been made with use by people you love...it needs to stay tht way. Happy VTT..
Oh my goodness! Let's stop the presses here and go back to what I wrote in the post! 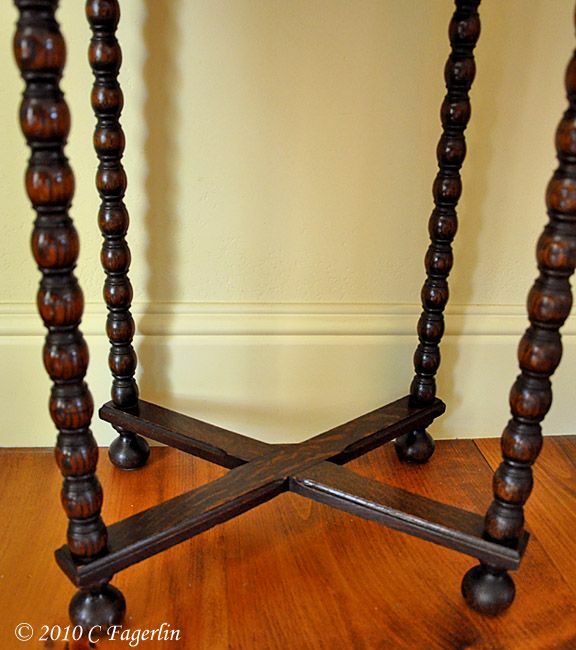 "I just can't bear to remove the original finish and make it just another spool leg table." Thank you all for your lovely comments about my Grandma's little table. I will NOT be painting it. I guess I wasn't clear, perhaps if this had been picked up at a tag sale or flea market I would paint it. It would have no personal memories attached to it, but in the case of this particular little table it is ALL about the memories. What a lovely post for VTT! 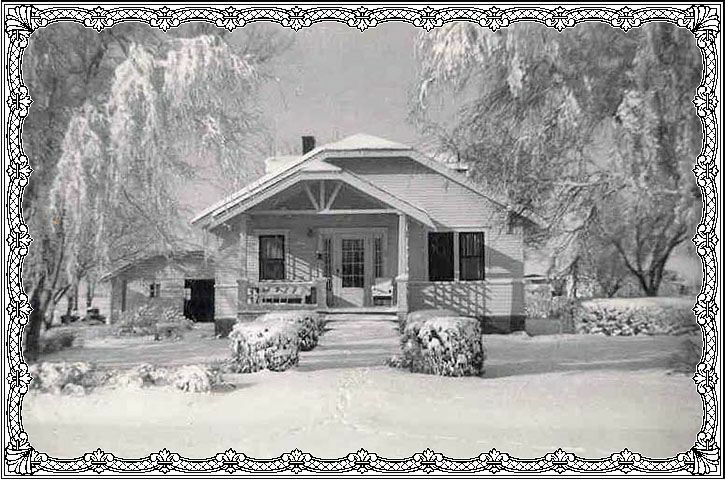 Your grandmother's house in the snow is so charming and inviting. Your sweet little table that belonged to her is too precious to paint. That would be fine for a piece from a garage sale that has someone else's memories, but not for yours. I'm sure your grandmother would be happy to know that you remember her so fondly!! Great table!! My Mom has one from my grandma that I just love. It has turned legs too but there are 6 of them and we always have called it the 6-legged table, lol. What a great table- The legs are fabulous! I love your vintage photos and reading about your grandparents. 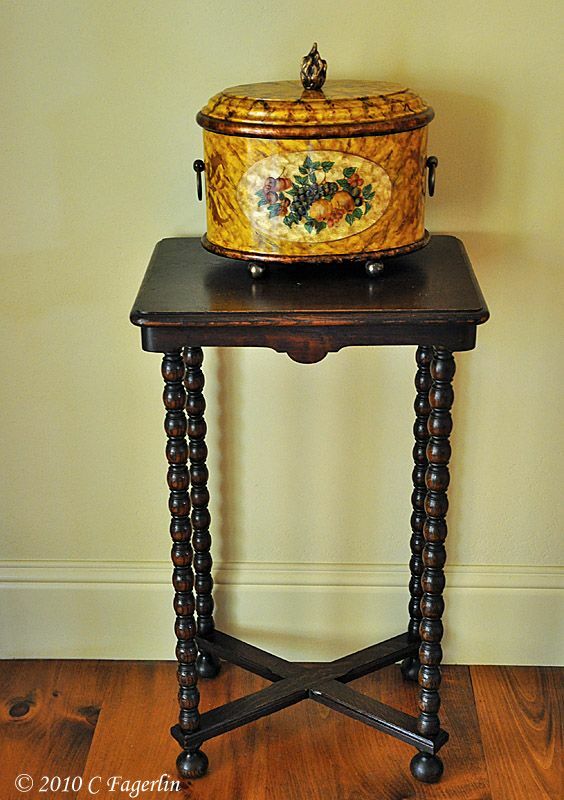 Your turned spool table is charming and so very dear, with all of it's memories. Thanks so much for coming by to visit! And a special thanks for your generous comments, Grandma is up there smiling down on us! Wow, this is such a beautiful little table, but more special are those memories. There are a few pieces like that in my family. I've never seen one like that before. it's very neat. I think your table is beautiful! I love the turned legs and the piece you have displayed on top. My Grandma had a small, green painted, telephone table about this size and I always wonder where it is now. It's so neat that you have that piece and it was passed from her to your Mom and now to you. I agree-definitely leave it as is! 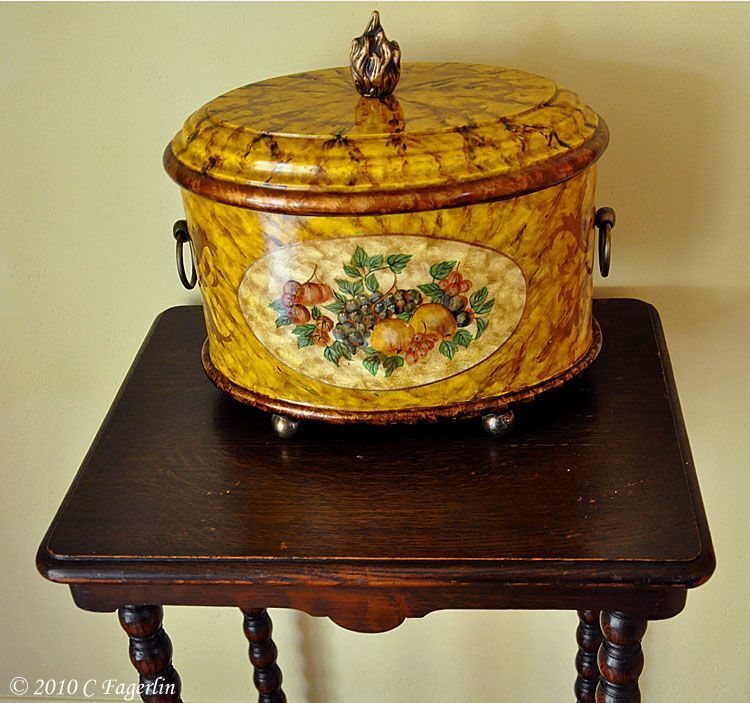 Its a wonderful family heirloom and the value is in the memories and the patina of the old finish! I just love the photograph of your grandparents in front of the wonderful car and the 1952 photo is a picture postcard! I'm sure that the best part of that spool table are the memories, but those cross pieces at the bottom look suspiciously like oak to me and because the table has stood the test of time I would say it's probably a very well made little table. I wouldn't paint it. If it's Oak, and you change you mind later, you will never get the paint out of the grain. I would re-finish it in a similar color if you do anything to it. Thanks ladies, I do appreciate you stopping by for a visit with Grandma's little table. Good morning! I found a link to you blog (and mine too!) on a RUSSIAN website. I’m sending the site and I also translated it with Babelfish translator. Thought you might get a kick out of this. Too funny!